Emma is a qualified artist and tutor. The wools she uses are sourced locally, or from British bred flocks, and mainly hand-dyed. Using local wools provides provenance between the fleece, and the farmers who provide it, the landscape and her creations. Emma loves the versatility of wool and how such a simple substance transforms, with a labour of love, into so many different forms. 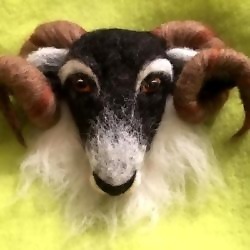 Emma uses traditional techniques such as wet felting, and more modern methods of needle felting, often combining the two. All her work is designed and made in her studio. A variety of designs are created for shows and fayres, and Emma receives many commissions for bespoke pieces. Due to the handmade nature of the work, each piece will be unique. Emma lives in the Brecon Beacons and Black Mountains of Wales, from where she draw much of her inspiration; Emma is also inspired and intrigued by folklore, and tales or our ancestors, finding that a little touch of magic sparks life into a new project. Emma is passionate about sustainability and aims to promote the many versatile uses of wool wherever she travels. As a qualified Tutor and artist, Emma loves to teach her art to others, as passing on traditional skills is very important to her - classes ranging from 1-2-1 to large groups. In addition, she also curates exhibitions and arts and crafts events. I specialise in creating my 'feltscapes' and 3D sculptures, which are often made to order, of either landscapes, portraits or symbology. In addition, I am busy running workshops and courses in felt-making techniques. I love creating both smaller quirky pieces, as well as bigger, bolder pieces of art.